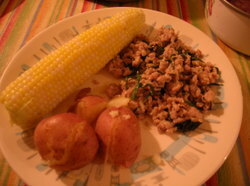 The Daily Digest: Corn on the Cob! It's been a while since I've eaten corn on the cob that deserved an exclamation point, but this weekend I had it twice. Gahlord and drove to central Vermont on an errand Thursday night, and discovered a great little roadside farm stand at Dog River Farm in Berlin. They sell lots of different sorts of vegetables, including tomatoes, broccoli and beets, but the highlight of their produce array is plump, fresh corn. We pooled all of our cash, bought eight ears, and had them later for dinner. 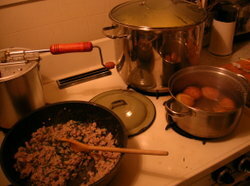 I was pretty hungry by the time we got home, so we had the fastest dinner we could make: new red potatoes boiled in their jackets, corn boiled briefly, and ground turkey from Misty Knoll Farms. The turkey was frozen into a block, but I put it in a pan over low heat and just kept scraping and stirring until it was cooked. I added butter, flour, and a little Butterworks Farm cream to the center to make a roux, then threw in salt, pepper, and tarragon from our now-overgrown herb garden. It turned out pretty tasty. The corn was so good I didn't even think about adding butter or salt. It tasted perfect, and each kernel crunched delicately, and deliciously, when bitten. We bought a full dozen ears when we passed through Berlin again yesterday, and had some last night for dinner with grilled buffalo sausage. It makes me happy to think of the leftover ears all cooked and waiting in the fridge: I'll either eat them cold, as-is, or take the kernels off and add them to another black bean salad later this week. — Our friends Angela and Ben hosted a potluck barbecue at their house, with grilled meats & veggies, and side dishes that included a roasted-beet-and-onion salad, local sauerkraut, beet-lettuce salad, black bean, corn, tomatoes and peaches, plus honey-blueberry buckle for dessert. There are only three more full days left before the Eat Local Challenge will be over. I won't say there aren't things I'm looking forward to having again, but we have eaten very well this month. i've been eating some delicioso michigan corn!